The Expert Council under the Ministry of transport of the Russian Federation acknowledged SkyWay string technology as innovative. The functioning model of the technology is now under construction on the territory of the Republic of Belarus. It means that one of the largest, strongest and most influential States in the world has confirmed the viability and prospects of the project. It means high authority and level. We do not want to encourage anyone and to promise anything at this stage, but it is, definitely, a victory. Let us try to recall how many years and by what ways the SkyWay Group of Companies moved forward to this governmental recognition. In 2002, an on-site joint meeting of the Scientific-technical Council of the Ministry of transport of Russia, the Scientific-technical Council of the Ministry of Railways of Russia and the interagency working group on high-speed off-street transport was held in the town of Ozyory, Moscow region, where the first test site of the first SkyWay generation was built. The subject of the discussion was the SkyWay transport project, which at that time was in desperate need of financial support. "The SkyWay transport system can be attributed to one of the new promising non-traditional types of overhead transport that preliminary demonstrated its viability," – says the Protocol (in Russian) of the joint meeting. Fourteen years have passed since that Mintrans STC meeting. The Russians, who were born in 2002, get their first passports today. In January 2015 Anatoly Yunitskiy received an invitation (in Russian) to the Russian Ministry of transport, and in February 2016 the General director-General designer of SkyWay Technologies Co. along with his team visited the Ministry for the presentation of the technology. Unlike the previous meeting 14 years ago, the meeting in 2016 in the halls of the Russian Ministry of transport was designed in completely different logics. The SkyWay team headed by the General designer did not ask for any financial aid or patronage. In 2002 A.Yunitskiy had a deep-laid project of the SkyWay transport system, a confirmation of the fact that the system is really workable (in 2001, a string-rail overpass and a simulator of the rolling stock of the SkyWay first generation were tested) and a great desire to improve the lives of ordinary people by implementing the SkyWay transport in reality. Fourteen years have passed, and since then only this desire has not undergone changes. All negative or unconvincing points raised by the members of the Scientific-technical Council while analyzing the SkyWay transport system, were taken into consideration and resolved. Following the recommendations (in Russian), we've tried all possible ways to get governmental funding for the project, have developed (in Russian) proposals for the preparation of the project of SkyWay circular route (in Russian), linking the airports of Moscow air hub and the objects of Moscow, have prepared a number of targeted projects and commercial proposals (in Russian), including those for hard-to-reach areas of Russia, permafrost regions and the Extreme North. Despite all efforts, the government entities of the Russian Federation did not provide any promotion, which the SkyWay team needed; they did not manage to implement SkyWay transport on the territory of Russia. 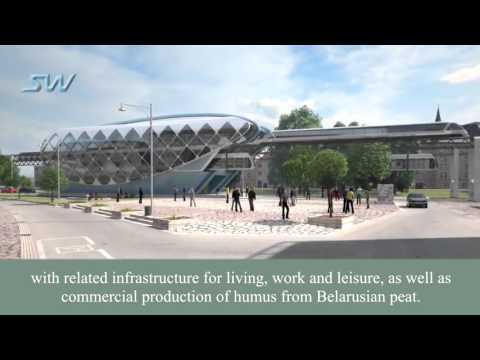 Eventually Anatoly Yunitskiy took a strategically correct decision, choosing the Republic of Belarus, his home country, on the role of the homeland for SkyWay innovative technologies. Right here, it became possible to rent a required plot of land. For the implementation of the project, Dr. Yunitskiy gathered a team of the best specialists of engineering profile, and paper drawings have turned into EcoTechnoPark, a demonstration center where construction works go on every day, bringing the project to a long-awaited final. According to preliminary estimates, partial commissioning of EcoTechnoPark into operation will begin this year. Media support also strengthened, increasing manifold both the army of investors, helping the project, and the army of skeptics who regularly blamed Yunitskiy personally and the whole SkyWay team with selfish goals. However, most importantly, during this time the General designer came to the decision of rejecting the attempts to find governmental financial support. Making the choice in the direction of crowdinvesting, Anatoly Yunitskiy presented to the SkyWay project independence (especially financial) from the State. Perhaps that is why representatives of the Ministry of transport of the Russian Federation reacted to the SkyWay transport project with great interest. However, it is impossible to sum up some interim results at this stage. Just consider the facts. However paradoxically this may sound, but for innovative projects that do not require large financial investments, the conditions of economic crisis are a favorable environment from the point of view of the "disposition" of state agencies. Federal expenditures on construction and modernization of roads increase every year. The length of public roads in the Russian Federation is 1.4 million kilometers. Federal highways account for 51 thousand kilometers, regional — 503 thousand kilometers, local — 842 thousand kilometers. About a third of regional and local roads have no hard coverings – that is, in fall and spring nearby communities have virtually no communications either with each other or with the center, which means a forced autonomy and inability to access to medical aid, essential goods and services. In a recent interview to "Moskovsky Komsomolets", the Secretary of the Russian Security Council Nikolai Patrushev, answering the question about prospects of the Russian economy, called Russia a self-sufficient country, capable "to supply itself by itself". And in order to supply itself by itself, it is necessary at least to cut down the expenses of the state budget. For comparison: Russia on average spends on the repair and construction of motor roads alone almost three times more than on the space program, and about 10% less than on healthcare. In the long term, it is impossible to count on the reduction of this financial volume, due to high transportation costs, expensive construction materials and the monopolization of the market. One is tempted to ask the question: is the budget distributed efficiently, if such funds are spent on the maintenance of only one type of transport? In this respect, the SkyWay project announced itself as a new competitor in the field of transportation. A competitor who shows great hopes and claims a leading position through the efficiency and low capital costs of construction and further operation, which is an important factor in the conditions of economic crisis prevailing in Russia. The Ministry of transport of the Russian Federation have analyzed the SkyWay transport system based on the criteria of attribution of goods, works, services to innovative products and (or) high-tech products for the purpose of forming the plan of purchasing such products. Here is an extract from the minutes of the Expert Council meeting on enhancing the innovativeness of state procurement in the transport sector: "It is decided to recognize the technology for creation of freight, urban and high-speed SkyWay transport systems as innovative. It is recommended to SkyWay Technologies Co. to present additionally the project of using the proposed SkyWay transport system for specific operational conditions. It is recommended to prepare a comparative analysis of the proposed innovative solutions compared to similar existing technologies in collaboration with the Branch innovation center of import substituting transport technologies". We will not encourage anyone – nobody promised us anything. But now the absence of any negative reaction is already a positive indicator. We do not claim government support, which, as practice shows, is rendered only to those who asks for nothing. Or asks only one thing – not to interfere.